Above is Georg Solti's recording of the symphony missing from the Colin Davis' Tippett cycle, the 1977 Fourth which was a Chicago Symphony Orchestra commission. The Decca recording did appear on a CD coupled with The Knot Garden, but is now deleted. 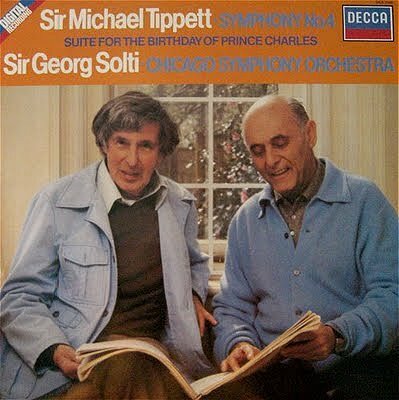 The LP coupling was Tippett's Suite for the Birthday of Prince Charles commissioned by the BBC in 1948 to celebrate the birth of the heir to the throne. I am told by someone who tried to programme the Suite in the royal presence some years ago that Charles hates the piece. Which must make it very good music indeed. I'm a composer. I just wrote a piece for the national choir of Australia called "Tra$h Ma$h, Homage to Michael Tippett", a hyper-mashup of tiny fragments of about 40 different pop songs. The bits come and go in a really chaotic way, because they stick to the key and tempo of the original song!